Congratulations to our Wild West Fest major prize winner! Thank you to everyone who made our Wild West Fest at Manor Lake so much fun! The holiday event was enjoyed by residents and families with plenty of free entertainment and fun! We're bringing the Wild West to Manor Lakes, and you’re invited to join us to celebrate all things Country Western on Australia Day, Saturday 26 January. Dress up in your best Western gear and saddle up for a whip cracking and horse show, pony rides, petting zoo, buck n spin bull ride, and plenty more awesome entertainment. Ison Road construction work was unfortunately delayed in recent weeks as a result of issues with the provision of asphalt to the project. Local residents have successfully campaigned for Manor Lakes to be recognised as a suburb in its own right. Notice of the registration of Manor Lakes by the Registrar of Geographic Names was published in the Victoria Government Gazette on 17th March. In order for the suburb status to be formalised, the process requires Wyndham City Council to be officially notified by the Office of Geographic Names. We received great news for all Manor Lakes residents today, City West Water have advised us that recycled water will be supplied to over 3,750 homes in Wyndham Vale and Manor Lakes from tomorrow, Wednesday 15th November. 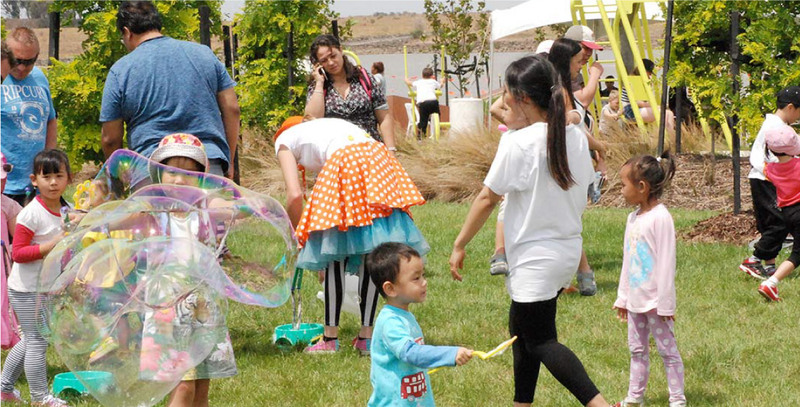 Come along to a fabulous day of colour, fun and entertainment at Manor Lake’s Australia Day celebrations, Thursday 26th January at Manor Lake. There’ll be dancing, pony rides, an inflatable island and much more. Come dressed in your own Australia Day cultural outfit for the chance to win great prizes. Have you registered for the Manor Lakes Wyndham Rotary Fun Run? All proceeds are going to Mercy Hospital, critical care unit. Register by February 19th to catch early bird pricing and have a chance to win one of the pairs of the Mizuno shoes still up for grabs. The Dennis Family Corporation has commenced a complete refurbishment of the Manor Lakes entrance fountains. After more than a decade of operation, it has become necessary to carry out a complete overhaul of the local landmark, comprising full replacement of the electrical and plumbing systems. A total of 13 not-for-profit groups operating in the Wyndham area will share in $13,000 of financial grants through the 2017 Manor Lakes Community Fund. The annual grants are distributed by Manor Lakes estate project manager the Dennis Family Corporation, with the recipients being determined by an independent judging panel. This year’s successful applicants will each receive a $1000 grant, to be awarded at a presentation function on 11th October. We're having a party in the park! Come along and celebrate the opening of the new park at Lollipop Hill. It'll be a fun filled day of entertainment with shows by Willy Wonka, Miss Sprinkles and more. MANOR LAKES SUBURB UPDATE - IT'S OFFICIAL! Another important step in the transitional process of Manor Lakes becoming a suburb in its own right has been reached. The Office of Geographic Names has advised that it wrote to Wyndham City Council on 15th April advising that the suburb name Manor Lakes has been finalised and is now shown on the Victorian State Government Department of Environment, Land, Water & Planning website within the Locality Names and Boundary Maps section as Version 5.6 for Wyndham. Wyndham Vale Train Station Voted Victoria's Best! Living in Manor Lakes just gets better and better. We were delighted by the arrival of the new Wyndham Vale train station in June last year, which has resulted in easier commuting to and from Manor Lakes for our growing community. We're bringing the beach to Manor Lakes and you’re invited you to join us to celebrate all things summer on Australia Day, Friday 26 January. Throughout this fun-filled day, you and your family can enjoy a variety of entertainment zones including a pop-up beach complete with sand and beach themed sports activists.